Fly - it's never ben easier to fly from the UK! 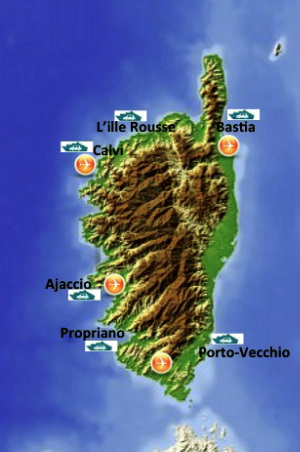 Airlines serving the island directly from the UK are Easyjet, Flybe, Titan, BA and Air Corsica. Easyjet fly from London Gatwick to Bastia, Ajaccio and Figari. They also fly from Manchester to Bastia. There are charter services from London Stansted or Manchester to Calvi and a BA service from Heathrow to Figari (note - some of the Corsican Places flights include bike carriage). Flybe have seasonal services from Birmingham and Southampton to Bastia. Air Corsica introduced direct flights from Stansted in 2018 to Bastia, Ajaccio, Figari and Calvi between April and October. Just Corsica and Corsican Places have a good summaries on their websites. The alternative at other times of the year (or on some summer weekdays) is to fly to Paris Orly, Nice or Marseilles and then connect with Air Corsica (can also be booked via Air France) to any of the island’s airports. Connections vary by day of the week and time of year. It is also possible to fly to Bastia, Ajaccio and Figari from Paris CDG with Easyjet and again with Easyjet from Geneva. Package - the main tour operator for UK visitors is Corsican Places, Just Corsica and there is also Simpson Travel. Both offer a range of villas and/or hotels at the coast and inland throughout the island. Accommodation - there is plenty of accommodation to be had from hotels, gites, villas, camping and chambres d'hote (B&B). Being a holiday island it's best to make some plans both in the high season because it's busy, as well as outside this time because there's so much less on offer. If you are making your own plans then the Visit Corsica website is a good place to start.